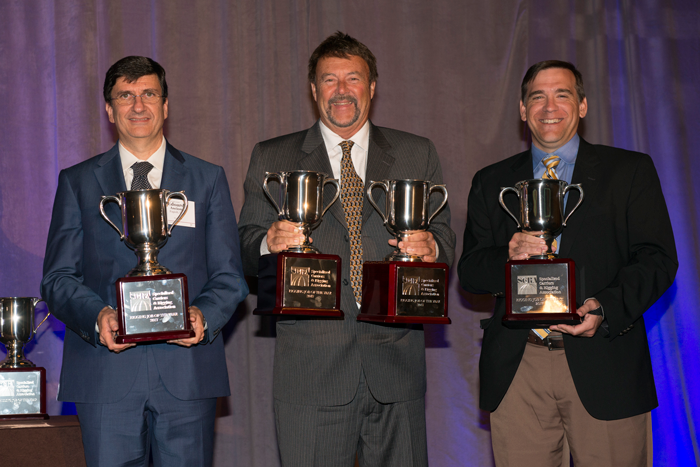 (Centreville, VA - May 12, 2017) - The Specialized Carriers & Rigging Association (SC&RA) announced the winners of the Rigging Job of the Year Awards during their Annual Conference, April 18-22, at the Westin Kierland Resort, Scottsdale, Ariz. The Rigging Job of the Year competition recognized four projects that illustrate the expertise and talent needed to meet the most daunting and imposing professional challenges encountered in rigging. Each winner demonstrated ingenuity, diligence, and safe execution. The awards went to Fagioli, SPA, Sant’llario D’Enza, Italy in the over $2 million category; Emmert International, Clackamas, Ore., in both the $750,00 to $2 million category and the $150,000 to $750,000 category; and Barnhart, Memphis, Tenn., in the under $150,000 category. Fagioli recently completed marine transport and installation for one of the most impressive oil and gas projects ever undertaken in the offshore industry. The project, planning through completion, lasted from 2012 until 2016 and at its peak employed 225 on-site workers. Fagioli handled platform models ranging from a 126.7-ton Helideck, to a 4,299-ton Drilling Support Module, all the way up to a 48,501.6-ton Utility Processing Model. The team at Fagioli utilized a variety of equipment in creative ways at the Canadian offshore assembly yard, including: 240 SPMT axle lines, strand jacks with capacities up to 1,488-tons, and an elevator system with a 7,736-ton capacity. The project included a skidding operation for the Utility Processing Model that used 64 skid shoes on a semi-submersible ship in Korea. The project represented one of the largest fleets of equipment used for the assembly of an offshore platform, all completed according to the most demanding safety standards. Emmert International employed a unique and creative rigging plan to install the largest press in the Western hemisphere. The job occurred in tight conditions at a fully functioning plant in Illinois and avoided impeding on any of the regular plant operations during installation. Typically, presses are installed one piece at a time, but Emmert took the creative initiative to assemble the press base and lift it as one component into the foundation pit. Emmert designed custom rods and links to lift the impressive 1,627,096-pound base. The project required expert planning and execution in order to adapt to the tight confines of the plant site. A 450-ton gantry was used for offloading components onto a 12-line Goldhofer PSTe and then lifted and lowered into place by a second 700-ton gantry within the plant. Throughout the process, safety was the number one goal of the operation, which included a daily safety briefing, regular inspections, and a pre-lift safety plan. Emmert disassembled and removed the Willamette River’s structurally deficient Sellwood Bridge, built in 1925. The job faced challenging constraints due to the bridge’s geographic location, limited hours because of daily traffic and noise limitations, the age of the old structure, and concern for the local river ecosystem. To move the bridge spans, varying in weight from 372,000 to 476,000 pounds, Emmert designed custom T-brackets and box beams with strand jack rocker plates for the rigging/lift system. The custom design helped eliminate welding and grinding on the bridge, which contained a potentially toxic coat of lead paint. The bridge spans were lowered onto a pre-aligned barge during high-tide to prevent the barge from touching the river bottom. Both employee and environmental safety was a central concern of the project. All ballasting was done utilizing a fish weir to assure juvenile fish and marine life weren’t drawn into the pump. Daily inspections to protect migratory birds were performed, and permitting was approved by a variety of government agencies. A custom-engineered fall protection cable system was used for the strand jack support beams. At one of the world’s largest integrated refineries, it’s not a question of if a unit will go down, but when. Such was the case when Barnhart Crane & Rigging was contacted about an emergency project removing and replacing a ground-level exchanger cell. Barnhart performed outstanding work in cramped conditions with only a five-day turnaround from identification to installation. The exchanger shell was 17-feet long, 3.17-feet wide, weighed 7,000 pounds, and was in a narrow alley with an obtrusive overhang. Barnhart’s solution was a custom Movable Counterweight Cantilever System (MOCCS) with 30 kips of counterweight setting atop and secured to a 750-ton hydraulic turntable secured to six lines of Goldhofer PSTe. The custom MOCCS system was able to stab inside the exchanger, lift out in a very tight area, and rotate the shell 90 degrees for transport out of the unit. The whole project mobilized over a weekend and was guided by the plant’s and Barnhart’s internal safety protocols. Click here to view a photo of the winners. ALE Heavylift was awarded the Malikai project by the Technip MMHA Joint Venture to perform a full-array of highly technical move, lift, and load-out work for a complete Tension Leg Platform (TLP) onto a heavy-lift vessel, weighing 27,500t. Barnhart was challenged with lifting and setting multiple pieces for the construction and installation of a ship-loading facility. The pieces included cradles, boom sections, and single and double trusses. The lifts were completed using Barnhart’s exclusive barge crane and a 1,800-ton Terex CC4000 ringer crane. Barnhart was contracted to develop and execute a rigging solution that would allow the erection of a videoboard over a speedway that would be converted to a football arena without removal of the seating and boxes during erection. Burkhalter was contracted to attach jack-up equipment to lift a 3.190-million-pound, 330-foot-long span portion of the Fore River Bridge, roll-on to a twin barge assembly, and jack-up to approximately 700 feet. In India, Fagioli was involved in the lifting and locking of 10-floor composite slab sections, complete with mechanical, electrical, interiors, and façade works of three wings using multiple combination of a strand jacking system. George Young Company was tasked to install a shoring system capable of supporting 3,000,000-pounds, per girder, for a damaged high-rise in Philadelphia. Oxbo Mega Transport Solutions provided equipment to lift and set four 1,100-ton tanks and four 600-ton tanks for barge construction that necessitated the design and engineering of 1,200-ton capacity gantry system mounted on a skid system. Barnhart was contracted to remove a 198,000-pound vertical exchanger and replace it with a new exchanger weighing 204,000 pounds in a live unit. Fagioli was involved in a challenging salvage operation of a 90-ton sunken boat laying 370 meters below sea level on the floor of the Mediterranean Sea. Burkhalter set a 160,000-pound galvalume pot in an operating facility using gantries and equipment on the top floor while the plant was still operational – setting the pot into the basement with only inches of clearance. Mammoet USA South was contracted to assist in an offshore refurbishing project using a jack system to raise a platform to shorten the legs and refurbish the 880,000-pound deck. TNT Crane & Rigging was contacted to help set a scale model of a fixed oil production rig built on stell legs inside the Moody Gardens Aquarium Pyramid. The project’s challenges included working inside a 12-story tall glass encased pyramid to lift a 15,000-pound, two-section glass tank up and over an existing steel oil platform. The Specialized Carriers & Rigging Association (SC&RA) is an international trade association of more than 1,300 members from 46 nations. Members are involved in specialized transportation, machinery moving and erecting, industrial maintenance, millwrighting and crane and rigging operations, manufacturing and rental. SC&RA helps members run more efficient and safer businesses by monitoring and affecting pending legislation and regulatory policies at the state and national levels; researching and reporting on safety concerns and best business practices; and providing four yearly forums where these and other relevant member issues can be advanced.